In the 1980s, Guatemala’s military regime committed hundreds of massacres of unarmed civilians. A UN-sponsored truth commission estimated that as many as 200,000 people were killed during the country’s 36-year civil war and concluded that the Guatemalan military had carried out “acts of genocide.” Human Rights Watch launched its work in Guatemala in 1982, documenting massacres of indigenous communities and other atrocities by government forces. Since the signing of peace accords in 1996, they have pushed for accountability for past abuses and supported efforts to strengthen the rule of law. 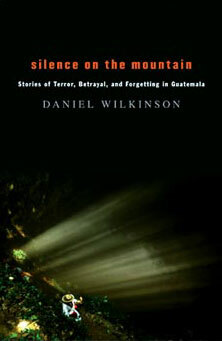 In 2002, Daniel Wilkinson, the Human Rights Watch deputy director for the Americas, published Silence on the Mountain: Stories of Terror, Betrayal, and Forgetting in Guatemala which examines the impact of political violence in Guatemala through a narrative account of an investigation into atrocities committed in the country’s coffee-producing region and won the PEN/Albrand Award for nonfiction. The following excerpt from the book details Wilkinson’s time spent in the Sacuchum region and how he first heard accounts of the massacres. Read reviews of the book and learn more at the book’s Web site. But then she had a revelation. It was 1982, and she was crossing Lake Atitlán in a motorboat driven by a man who had worked for the family for many years. In the middle of the lake, the man suddenly slowed the boat and turned to her. “Doña Sara,” he said, “there’s something that I think you should know.” He then told her that the army had massacred an entire village. He explained what had happened, and, when he finished, he continued their trip to the other side of the lake. At first Sara wasn’t sure what to make of this news. She confided with a Guatemalan friend, who said that she too had heard about the military killing large numbers of civilians. They wondered if it was really possible. “It was difficult for us to believe. You see, many people in the capital were sheltered from the massacres.” And they continued to doubt the mounting evidence that the army was killing civilians, until it became too overwhelming to ignore. Who was really supporting the guerrillas? Two years after I began asking questions, I still didn’t know for sure. According to César and his friend Jorge Fuentes, everyone in the plantations supported them until “what happened in Sacuchum.” I had heard a similar account from the Guilléns in Guatemala City. And in La Igualdad — where I had gotten only vague answers and then had stopped asking — the stories also revolved around this place: Sacuchum. I had often gazed up at the mountain above La Igualdad and wondered whether or not it was a volcano. Now I began staring up and wondering about this place Sacuchum. Sacuchum de los Dolores was its full name. Sacuchum of the Pains. Something awful had happened there that had changed the course of the war. Sacuchum of the Sorrows. It seemed to be the black hole of history, sucking everything around it into its darkness. From below in La Igualdad, you couldn’t see any kind of clearing, no lights at night, no smoke rising, no movement except that of the clouds that drifted by and occasionally gathered around the peak. I knew that there was a path that left from the top of La Patria, climbed through the forest, and supposedly reached Sacuchum. It would be a beautiful hike. But the war was still going on, and that woods was one of its battlefields. I also knew that there was a road that climbed to Sacuchum from the San Marcos plateau on the other side of the mountain. And I often thought about taking the motorcycle up that way. It would be tough going — far worse than on the roads in La Igualdad, which were kept passable by the plantations. It would probably take hours. And once I got there, what would I do? Who would talk with me? So all I could do was stare up and imagine and wait until I found someone who knew people there. I found that someone in an unexpected place. I was in Cajolá, interviewing a group of old men about the history of the community’s lands. They were speaking Mam punctuated by words of Spanish — an unusual combination, like someone playing two different instruments simultaneously: Spanish consonants formed at the very front of the mouth, while the guttural clicks and rasps of Mam came from back in the throat. A younger man was translating for me. Or rather he was interrupting the men’s stories every now and then, condensing what had been spoken in Mam, and pushing it into Spanish syllables at the front of his mouth — and in the process, it seemed, passing the stories through a sieve that yielded only fragments of the original. They were talking about a man who, in times long gone by, had petitioned the government to protect the community’s lands. His name was Pe’t Chum, and it was said that he had possessed special powers. One of these was the ability to travel long distances in little time — so, for instance, the trip from Cajolá to the capital, a walk that took others several days, he could do in just a few hours. These powers were somehow linked to the fact that although he was human, he had a tail like an animal. I asked if his name meant something in Mam. He was “Chum,” they answered, because his family was originally from a place called Sacuchum. “The Sacuchum in San Marcos?” I asked. My translator was Pascual Huinil. I had known him for over a year, since before traveling to La Igualdad, when I had lived in Cajolá for a few weeks. After I left Cajolá, we had continued working together in an effort to obtain international funds for a sewage system in the community. He put me up at his house numerous times and had stayed in my Xela apartment more than once. Passing through? The road up from San Marcos came to a dead end at the town. “Where to?” I asked. Just around the top of a mountain? I didn’t press for an explanation, and only much later would Pascual offer one. Now he told me that he had stayed with a family there and had heard about the massacre a few weeks later. He had never gone back. But he did know some people from Sacuchum, and he could arrange for me to meet one of them. The meeting took place in Guatemala City, in the office of a national indigenous rights organization to which people from both Cajolá and Sacuchum belonged. The man from Sacuchum was named Fabián Ramos. He was working on a campaign to obtain land for the community. He said he could tell me about the massacre, but he thought it would be even better if I went with him to Sacuchum and talked with some of the survivors there. I immediately agreed. Here was my chance to finally see the summit of the mountain — and find out what had happened there. “Why didn’t they pay more?” I asked. His car was a Land Rover. The kind that I’d seen crowding up the Long Island Expressway as wealthy New Yorkers headed out to the Hamptons for the weekend. Unlike them, he actually drove regularly on the kinds of rugged roads its safari features were designed for. The CD player was an accessory. As for benign paternalism, he offered his wife as an example. She had recently insisted that for their wedding anniversary, instead of giving her a present, he would fix up the workers’ quarters on the plantation. He would install electricity and running water in their homes. He shook his head. “I use all my land. There’s not an inch unused. And I tell you frankly I’m not going to give up any of it. I want more, in fact. You have some, and you want more.” In this respect, he pointed out, Guatemalan landowners were no different from people in other countries. And that was why they so deeply resented “the human rights” always singling them out for mistreating people. The human rights. Like other wealthy Guatemalans, he used the term to refer not to a set of moral or legal principles, but rather an interest group intent on besmirching their country’s image abroad. “What’s screwed us over more than anything,” he had told me over lunch, “are the human rights.” His wife had tried to explain the source of resentment: by exposing the country’s old wounds, human rights advocates were preventing any healing from taking place. And what really pissed him off, he had added, was the way these foreigners came criticizing this country that they don’t really know. So what did he know about Sacuchum, I wondered now as I prepared to visit the community. If he didn’t know what had happened there, how could he criticize the ignorance of “the human rights”? And if he did know, well, might that not be even worse? Fabián Ramos met me in the central square of San Pedro one Thursday afternoon. He was a small, quiet, busy-looking man, although he seemed more at ease here than he had been in the capital the week before. He had with him a hundredweight nylon sack, which he flung over his shoulder after shaking my hand, and stooping under its weight, he led me to the bus stop. Thursday was market day in San Pedro, and the streets around the market filled with people coming and going like bees around a hive. San Pedro was the twin city of San Marcos. At least they looked like twins on the map — though, in fact, the two towns were separated by a lot more than the little creek that ran between them. San Marcos was the political center of the department; San Pedro was the commercial one. San Marcos was a Ladino town; San Pedro was an Indian one — or had been until Justo Rufino Barrios declared its residents Ladino by presidential decree. Few people in San Pedro still spoke Mam; few women still wore traje. But whether or not they considered themselves Indian, they took pride in at least one thing: they weren’t from San Marcos. On the other side of the creek, the feeling was mutual. The bus bound for Sacuchum was overflowing with people and their cargo. Sacks and crates were stuffed under seats and into overhead racks and piled on top of the roof. People stood outside, waiting for the driver’s signal to cram themselves in with their things. The majority of families in Sacuchum lived off commerce, Fabián explained to me as we waited. Every Thursday they came down to the San Pedro market, bought bulk quantities of vegetables and grains grown in the surrounding highlands, and brought them up to Sacuchum. Then during the weekend they fanned out over the other side of the mountain, selling their merchandise in the plantations and setting up stalls in the Sunday markets in La Igualdad and the three other towns. Sacuchum, it turned out, was the commercial hub of the mountain, the primary grocer in the subsistence economy of the plantation workforce. And in addition to agricultural products, it supplied lumber and the homemade liquor known as “cusha.” The forest around the mountaintop provided the wood, and it also hid their clandestine distilleries. The women waiting around us wore traje — the green and gold pattern that few people in San Pedro still wore. But no one spoke Mam, and Fabián told me that few of the people in Sacuchum still did. I asked about the name of the town. “Los Dolores” came from the Virgen de los Dolores. And “Sacuchum” was Mam for “dry throat.” Why that name? He guessed that it might be because, in the old days, before there were cars, people would carry their cargo up the mountain on their backs and arrive in town with their breath short and their throats dry. The overloaded bus lumbered out of town, south toward the mountain, and began to climb. I expected the dirt road to deteriorate, but to my surprise it didn’t. In fact, the farther we climbed, the better it seemed to become. The ground was packed solid and smooth, without all the rocks and furrows that plagued the roads below on the piedmont. The slope soon became too steep to take head-on, and the road swung eastward, climbing at an angle up the mountainside. Down to the left now were the twins, Marcos and Pedro, facing off against each other, a thousand feet below. As the bus made its way around to the eastern side of the mountain, they disappeared behind us. Now we could see the road to La Igualdad, three thousand feet below, and the ravine carved by the Naranjo River dropping another thousand feet farther. The mountainside alternated between sheer rock face, steep slopes blanketed with thick forest, and patches — wherever the ground was even remotely level — that were planted with rows of corn. Climbing further, we were enveloped by clouds. The distances suddenly vanished. The ground below us disappeared. And we were left with only the hum of the engine. We might have been in an airplane. A cow floated by outside. We kept climbing. The cloud thinned around us and disappeared. And the bus pushed over one final ridge and slowed to a stop. We were at the top. Below us was a small valley, walled in by steep ridges, like a crudely formed bowl with a jagged rim. The rim was broken in places. A gaping hole on the western side gave way to a thick tumble of clouds. A smaller break, directly across the valley, opened out onto blue sky and the top of a cloud that was climbing the mountainside above La Igualdad. In the valley there was a little town. A white church with a small belfry overlooked an open square; two box-shaped buildings faced it on the other side, presumably the school and the town hall; a soccer field stretched behind them; a loose grid of paths extended outward, past small houses surrounded by corn and pasture land. The mountain — eight thousand feet of rock, clay, and ash rising up from the coastal plain — culminated in this: a quiet hamlet, cradled within wooded ridges, held up to the sky like an offering. Fabián left me sitting alone on a cot in one room of his two-room house. The pale light of late afternoon filtered in through a single window that opened onto a row of green corn stalks. We hadn’t had a moment alone since we met below in San Pedro. I hadn’t asked how we would arrange our interviews, and he hadn’t raised the topic himself. I assumed he would be taking me to talk to a select few people in their homes. I imagined hushed conversations behind closed doors. If people in La Igualdad had been reluctant to tell me about the violence, I figured people would be even more so here, where things had supposedly been so much worse. The interviews would take time. And night was approaching. We would have to get started soon. The clouds rolled over the ridges and sealed in the valley like a heavy lid. It began to rain. We got wet as we made our way through the darkness to the center of town. A dozen or so figures huddled under strips of plastic outside the town hall. The door was locked, and Fabián left to go look for someone with a key. I stood alone listening to the rain and wondering whether I had been a bit rash coming here with this person I barely knew. After the robachicos scare on that island two years earlier, I had promised myself never to get stuck alone in an unfamiliar community again. But here I was, on top of a mountain, surrounded by strangers, and with no way out until the next bus left in the morning. What’s more, the whole town knew I was here to investigate what might be the worst atrocity committed by the army in the region. Fabián returned with a man he introduced as Apolinario. Apolinario opened the door and I followed him into a single large room with a table at one end and a series of benches facing it. Fabián and Apolinario led me to the table. The people outside filed in, others followed them, and soon the room was packed with some forty people. The two front rows of benches filled with old women in traje. The other rows filled with older men, and others stood at the back. The room was cold, and the faces looked ghostly in the pale light of a naked neon bulb. They gazed toward the front in silence, somber and impassive, waiting, as if before a mass. Fabián spoke first. “It is a great honor to have with us tonight in our community of Sacuchum, this señor who has come to document what occurred in the massacre of 1982 . . .” I was sitting on the table with my notebook in my lap. And as Fabián spoke, I looked around the room, trying to read the crowd. I had no idea what they were thinking. What this meeting meant to them. What they expected of me. Fabián was describing me again as an “important person.” And it made me feel like an impostor. There was nothing important about me. I was here only to get some background information that would help me understand the history of La Igualdad. I tried to think of what to say: I wanted to dispel any illusions about my “importance,” but I also didn’t want to disappoint them. I wanted to hear about the massacre, but I didn’t want to impose upon them — I was so used to people being afraid to talk about the war, even in private, that I couldn’t imagine anyone wanting to talk about it in public. I wanted to make people feel comfortable, but I myself was scared. I saw some young men standing in the far doorway and looked to see if any of them had military haircuts. When Fabián finished, all eyes focused on me. I cleared my throat and spoke slowly, first thanking Fabián for inviting me here. I said I couldn’t offer the community anything other than to record what they told me and try to let people know about it. I said that my aim wasn’t to create any problems for anybody — neither the victims nor the perpetrators — but only to find out what had happened. Again there was silence. I looked around at the unfamiliar faces. They looked back at me. The question hung in the cold air between us. I glanced over at Fabián, but it didn’t appear that he was going to answer it. I saw one of the young men in the back step out the door into the rain, and I imagined he was off to report what I had said. My eyes wandered the room, and my mind searched for a way to wrap up this meeting as quickly as possible. Then I saw an arm rise in the far corner of the room and a shadow of a man step forward. I nodded to him, and he began to speak. There had been a battle in the woods below, and all day long they had listened to the army bombing the mountainside. Then on Saturday the soldiers came up the mountain from all sides and surrounded the valley. The people had no idea what the army intended to do. So they waited. And on Sunday morning the soldiers came down into the town. Silence again. I imagined the scene: soldiers swarming up over the mountaintop and down into the valley. What I couldn’t conjure up was what had gone on in the houses — the images that must have been playing back now in those eyes that were watching me. The soldiers then herded the people out to the soccer field and made them form a line and present themselves, one at time, before a group of officials who stood with a civilian wearing a hood. The officials had a list of names and occasionally they would ask the hooded person: “Is it this one?” The people who appeared on the list were taken by the soldiers. The rest were ordered to return to their houses. There were to be no lights or fires, and anyone who ventured outside would be shot. I looked at the women who sat in the front row like a silent chorus. It occurred to me now that they weren’t as old as I had first thought. Yet there was something that made them appear prematurely aged. Their faces had that parched look you see in people who are perennially exposed to the sun in the Andes and other high places. Which was strange since this mountain wasn’t that high, and the other people in the room didn’t have it. The women gazed back at me, and when our eyes met they didn’t look away, as they probably would have under other circumstances. It was as if our gazes never really met, as if it wasn’t me they were looking at, but something I represented — something that, for some reason, was in fact important. When the voices subsided and I was able to look up again from my notebook, I saw that the place had been transformed. The room seemed somehow smaller. There was color in people’s faces. And moisture in their eyes. And warmth in the air between us. I now saw smiles around the room, like the first rays of sun peeking through the clouds after a storm. Someone said, “Just like the roads in New York, right?” And now people laughed. Fabián closed the meeting with a short speech thanking me for coming to hear what they had to say. He called for applause. It came loudly and didn’t stop. Yes, I could see now, they were applauding an important person: the first outsider who listened to their story. It could have been anyone; it happened to be me. When the applause finally petered out, one of the widows spoke up. She gave another speech thanking me for listening. Someone in the back called for more applause. And again, it was loud and long. When it died out, the people got up to leave. A widow who had been sitting in the front row, who had remained silent through the meeting, came up to me and offered a warm smile. “Gracias,” she said and walked away. I left the meeting feeling more certain than ever that the history of the violence on this mountain needed to be told — and, at the same time, more perplexed about its impact on the plantations below. How could the owners have possibly kept themselves oblivious to events as horrific as these? And why were the workers more reluctant than the people here to talk about what they had suffered? One afternoon, the middle-aged son of a wealthy cattle rancher gave me a ride from Coatepeque east on the coastal highway. The day was clear, and the crown of Sacuchum was silhouetted against the blue sky above us to the north. He drove a large American car, and he drove it fast, around sixty-five, which wouldn’t have seemed like much on another country’s highways, but Guatemala’s roads were not made for such speeds. This “highway” was really just a two-lane road with no divider and not much of a shoulder. The pavement was pocked with potholes. The holes forced most drivers to slow down. But they turned this one into a slalom racer. The only thing that slowed him down was the one-lane wooden ramp that spanned the space where a bridge had recently been blown up by the guerrillas. He began to talk about the virtues of hard work. He told me proudly of his daughter, who was studying to be an architect. In this world, a woman needed to be able to fend for herself. She shouldn’t have to rely on any man. “Life is difficult,” he said, “life is difficult for everybody.” Then he began to tell me about his wife. She had cancer. She had been operated on once. Now they could only wait to see if the tumors would return. He sped around a curve onto a stretch of road that was more populated than the rest. There were small cement houses and wooden huts thirty feet back from the asphalt, and people were going about their business by the roadside. My right foot was instinctively pressing the floor where the brake would have been if it were the driver’s side. His foot was on the accelerator. Up ahead a rooster stepped into the road. It was a large bird, two and half feet of muscle and magnificent plumage. It strutted to the center of the lane and stopped, surveying the asphalt as if it owned the place. When it noticed the car, it cocked its head to the side, started to strut in one direction, then panicked and darted back the other way. Too late. His foot came off the accelerator. But he did not brake. There was a dull thud, and the bird disappeared under the front of the car. We sailed ahead in silence, his foot hovering in the air. Then he shrugged. “What could I do?” He pressed down again on the gas and continued telling me about his family. Then he told me about a business venture he was hoping to undertake. He would import a chemical from Europe that could be mixed with asphalt to provide a more durable filling for potholes.With so many potholes to be fixed on Guatemala’s highways, there would be ample business. History wouldn’t be kind to that business venture. In December 1996, the Guatemalan government and guerrillas signed a peace accord, bringing an end to the thirty-six-year war. The government then cashed in its “peace dividend” — hundreds of millions of dollars from its wealthy trading partners — and bought asphalt. Asphalt flooded the country, filling the major highways and spilling over onto back roads that had never seen it (maybe even Sacuchum got some after all). Guatemala soon looked like a different country. The potholes were gone. I had gone back to the United States and enrolled in law school, thinking that maybe I should get my life back on the course it had been on before I visited La Igualdad. But as I sat in those classrooms, listening as the smart young lawyers-in-the-making sought to outdo one another with the language of “slippery slopes” and “inefficient outcomes,” my mind would drift back to Guatemala, to that mountaintop valley, to that widow releasing the floodgates of memory. Unable to concentrate on torts and contracts, I applied for another fellowship, took a leave of absence, and in the fall of 1997 headed south. Cajolá had shown me how much people could hide. Sacuchum had shown me how much they might want to tell — if they only had the right opportunity. And now, more than ever, I felt driven to find out what was hidden in La Igualdad and to find a way for the people who wanted to tell their history to do so. Millions from that “peace dividend” had also gone to the formation of a truth commission — known as the Commission for Historical Clarification — which the government had reluctantly signed off on in the peace accords. Once back in Guatemala City, I met the commission’s head investigator. The investigation had been under way for several months now, and they had already collected testimony from thousands of people throughout the highlands and in the cities. I asked him if they had been able to get as much in the coffee region on the piedmont. I said maybe I could help a little — at least in one community in San Marcos. He told me that the help would be appreciated and gave me the phone number of their regional office. Before I called that number and before I returned to La Igualdad, I went to pay a visit to the people who had just emerged from the shadow world of the war — the former guerrillas now returning to civilian life. Perhaps they would know who in La Igualdad could arrange the sort of meeting that I had had in Sacuchum. And perhaps they could tell me themselves how their war had transformed the region.